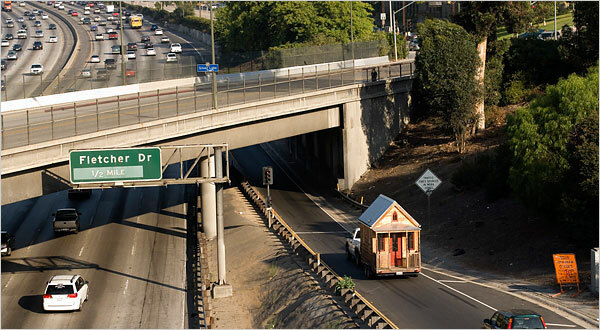 LITTLE HOUSE ON THE FREEWAY Jay Shafer took his 90-square-foot house on tour this summer, rolling along a Los Angeles highway. THE LILLIPUTIAN LIFE Some homeowners are using their new little houses as offices or retreats, like the 80-square-foot one owned by Michael Janzen. So why has Mr. Janzen spent the summer building an 80-square-foot “tiny house” out of free stuff he found on Craigslist? His business is still modest, but in the past year Mr. Shafer has sold five houses and 50 sets of plans, up from a yearly average of one house. The houses range in size from about 70 to nearly 800 square feet, cost $20,000 to $90,000 to build, and resemble birdhouses: boxy shape, wood siding and high, pitched roof. Other builders also report increased demand. Brad Kittel, owner of Tiny Texas Houses in Luling, Tex., said he had built 10 homes this year, up from four in all of 2007. In recent years, small dwellings have begun to get the high-design treatment, which could attract more people. The London-based designer Nina Tolstrup built the 388-square-foot Tiny Beach Chalet, which has drawn attention on design blogs. One of the stars of the Museum of Modern Art’s current exhibit on prefabricated houses is the Micro Compact Home, a 73-square-foot cube by the British architect Richard Horden. “When you build small you can spend money on higher-quality materials,” said Jared Volpe, a Web designer in North Ferrisburgh, Vt., who runs the blog smallhousestyle.com. Mr. Volpe said he is often amazed at how aesthetically pleasing many of the latest small homes are. In the year since he started his blog he has received increasing numbers of e-mail messages from people interested in small homes — a trend he attributes in part to the poor economy. “People will need to heat their 3,000-square-foot house this winter, and it’s going to cost double of what it did a few years ago,” he said. Others choose to actually live in theirs, like Dee Williams, whose 84-square-foot knotty-pine house has a tight but cozy interior. “I’ll have a sense of where the balance is,” he added — a sense that he hopes will help his family decide on a reasonable goal for downsizing, something he is eager to do soon. “We bought this house, I think, for prestige,” he said, sounding chastened. But while Mr. Janzen is dabbling with tiny living, others are plunging in. Tara Flannery, a 25-year-old college student in Seattle, plans to move within the next few months from the Craftsman-style two-story house she shares with roommates into a Tumbleweed house. The decision was largely financial. “I wanted to buy my own place by 30, and the way the housing market is going that’s not going to happen,” she said, referring to the tightening credit market and the fact that home prices remain high in Seattle, despite the mortgage crisis. In a way, Ms. Flannery’s tiny house, which will be about 100 square feet with a sleeping loft and will cost roughly $40,000, is a modern twist on the starter homes of the 1950s suburbs; it offers her a way into home ownership, of a sort, without the debilitating costs. “I can spend my money traveling instead,” she said. Ms. Williams, 45, said that before the move, “I was an environmentalist, but not a very dedicated one.” She built her house, which she outfitted with solar panels and propane heating, both to “walk the talk” of eco-consciousness and “to unshackle myself from a mortgage and doing repairs.” Although last year, like most Americans, she saw a sharp rise in her monthly energy bill, the increase — from $4 to $8 — didn’t exactly bankrupt her, she said. Asked if that were the case, Mr. Shafer said he doesn’t advocate for everyone to live as he does. “I know 100 square feet is too small for most people,” he said, including his new bride, who lives next door to Mr. Shafer in a 700-square-foot house (although he is planning to build her a 300-square-foot replacement). 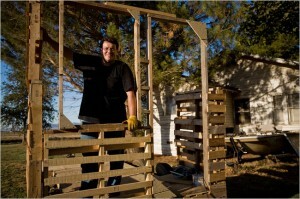 Instead, he wants to be a living example encouraging people to downsize, even if it’s only to a moderately smaller home. 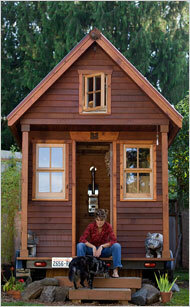 I love the idea of tiny houses, esp. for single people strapped for cash or wanting to do other things, but like your husband, I probably could not live in one longer than a weekend. My small apartment is too small for me right now. A few years from now, it may not be particularly if rents and housing costs continue to go up. What I love about this movement is the rebellious aspect as well as the practical one. To have an $8 electric bill and little to no mortgage is an excellent way to rebel against the economic plundering of consumers whose wages have gone stale while prices have not. Great article! Kudos to you and Michael!